William Edwards Sr., 51, of Camden was arrested by Ofc. Kevin Jorgensen for simple assault on July 21. James Q. Terron, 22, of Pleasantville was arrested by Sgt. Mark D’Esposito for receiving stolen property, unlawful possession of a weapon and possession of less than 50 grams of marijuana on July 21. Utika L. Canfield, 23, of Pleasantville was arrested by Sgt. Mark D’Esposito for receiving stolen property, unlawful possession of a weapon, possession of less than 50 grams of marijuana, obstructing law, and resisting arrest on July 21. Hannibal Ahmad A. Little,18, of Galloway was arrested by Ofc. Przemyslaw Ryba for possession of less than 50 grams of marijuana on July 21. Dashad D. Walden, 22, of Northfield was arrested by by Ofc. Przemyslaw Ryba for hindering apprehension on July 22. Keith Goodman, 30, of Estell Manor and Keith Kinsey, 24, of New York City were arrested by Ofc. Daniel Choe for receiving stolen property, possession of handgun, fugitives from New York State, and hindering apprehension on July 22. Asia S. Williams, 31, of Bushkill PA. was arrested by Ofc. Scott Winneberger for hindering apprehension on July 22. Michael T. Carney, 21, of Chesilhurst and Jessica N. Taylor of Pleasantville were both arrested by Ofc. Scott Winneberger for theft on July 23. Kenneth L. Brown Jr., 33, of Pleasantville was arrested by Ofc. Przemyslaw Ryba for possession of CDS, possession of a handgun, distributing CDS and possession of less than 50 grams of marijuana on July 23. Jessica N. Taylor, 21, of Pleasantville was arrested by Ofc. Scott Winneberger for theft on July 23. Gregory E. Kinash, 42, of Galloway was arrested by Det. Ryan Goehringer for theft, criminal trespassing, and receiving stolen property on July 24. Laura C. Dwornik, 25, of Medford was arrested by Ofc. Kevin Costa for DWI on July 24. Marlon A. Lloyd, 28, of Galloway was arrested by Ofc. Rita Abatemarco for criminal trespassing on July 24. Loren E. Green, 47, of Atlantic City was arrested by Ofc. Ray Casanova for aggravated assault and disorderly conduct on July 26. Sean C. Devinney, 20, of Galloway was arrested by by Ofc. Przemyslaw Ryba for possession of a hypodermic needle and drug paraphernalia on July 26. Joseph P. Milliken Jr., 18, of Galloway was arrested by Ofc. Kevin Welsh for possession of less than 50 grams of marijuana on July 27. Ashley E. Salvadore, 19, of Egg Harbor Township was arrested by Det. Ryan Goehringer for possession of less than 50 grams of marijuana on July 27. David Schwerha, 24 of Gallowaywas arrested by Ofc. Christian Magazzu for assault and possession of less than 50 grams of marijuana on July 27. Guy J. Wesley, 53 of Galloway was arrested by Ofc. Scott Winneberger for DWI on July 27. Dawn L. Wallace, 44 of Blackwood was arrested by Ofc. Carolyn Buckley for possession of less than 50 grams of marijuana and possession of drug paraphernalia on July 27. Kyle Broody, 26, of Brigantine was arrested for possession of CDS and possession of less than 50 grams of marijuana on July 27. 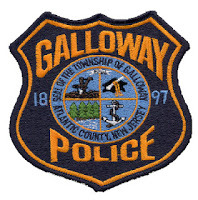 A 16 year old Galloway boy was charged on July 23 by Ofc. Kevin Costa with hindering apprehension, taking a vehicle without permission and violation of curfew.